Description: A tool for creating multi-point gradients from scratch. 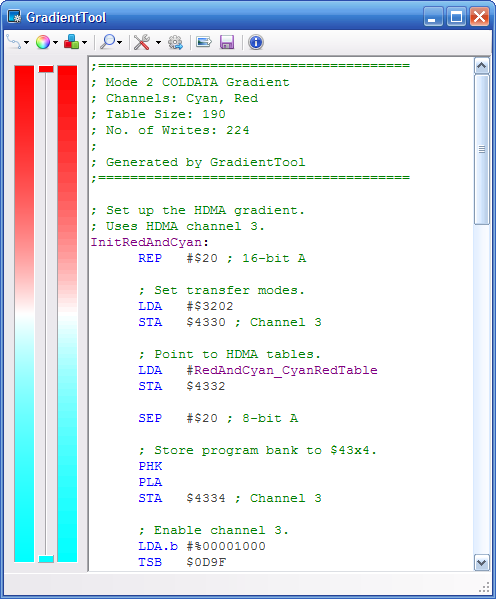 Generates HDMA which you can insert into your hack. Requires .NET Framework 4.0 or 3.5. Value-corrected RGB gradients are now the default. The default gradient has been changed to red → cyan to demonstrate RGB value correction. The tab pages in the HDMA configuration dialog can now be used without HDMA code generation.